The only National Park in the Northeast has been a target of mine to visit for a few years now and I was finally able to check it off the list. It ended up being a solo adventure where I made my homebase at Seawall Campground inside the park. After arriving in the afternoon in Bar Harbor the first thing I did was get my tent & campsite setup for the two nights I’d be staying there. My first taste of the park’s landscape was at Wonderland Trail, a 1.5 mile loop through a coastal section that offers a sample of it’s various habitats. 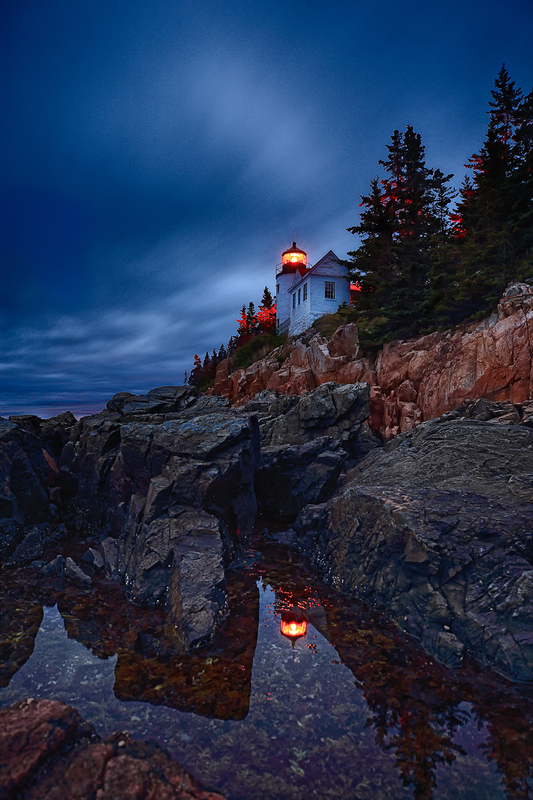 I then rushed over to Bass Head Harbor Light in order to get in position before the sun started setting behind the lighthouse. There were a good number of other visitors there at this popular attraction and I settled into a spot between several other photographers from other parts of New England. Unfortunately clouds rolled in about 30 minutes before sunset so a colorful backdrop wasn’t in the cards for me. I ended up staying after everyone else had thrown in the towel to keep trying for different compositions. When I stood in one particular spot I was able to catch the reflection of the lighthouse in a tide pool and using a long exposure captured a dramatic sky above. Alot of times when you’re out in the field the conditions don’t go quite as planned so you always have to be ready to adapt and change on the fly. 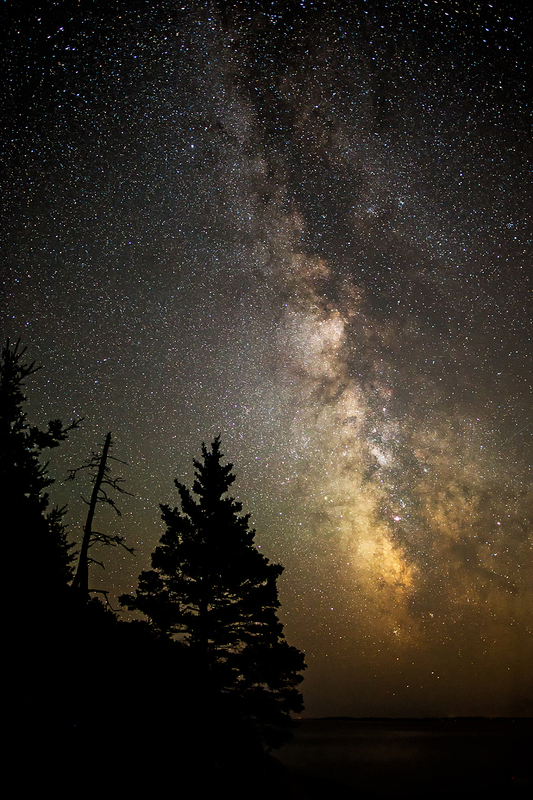 The weekend I was here also happened to be the annual Acadia Night Sky Festival which occurs every September during the new moon when the sky is the darkest for optimum viewing. They had a bunch of telescopes set up at the Seawall beach area across from my campground but thick cloud cover prevented any night sky viewing that night. I woke up around 3:45am the next morning to make my way over to Cadillac Mountain, which is the first place to view the sunrise in the United States, to get a spot for some photo opps. Unfortunately again crazy thick cloud cover blocked my views of the vista below and only got a quick glimpse of the early morning color. With foggy conditions I decided it was the perfect time to check out the paths and flat boardwalk of the Sieur de Months Spring section of the park. 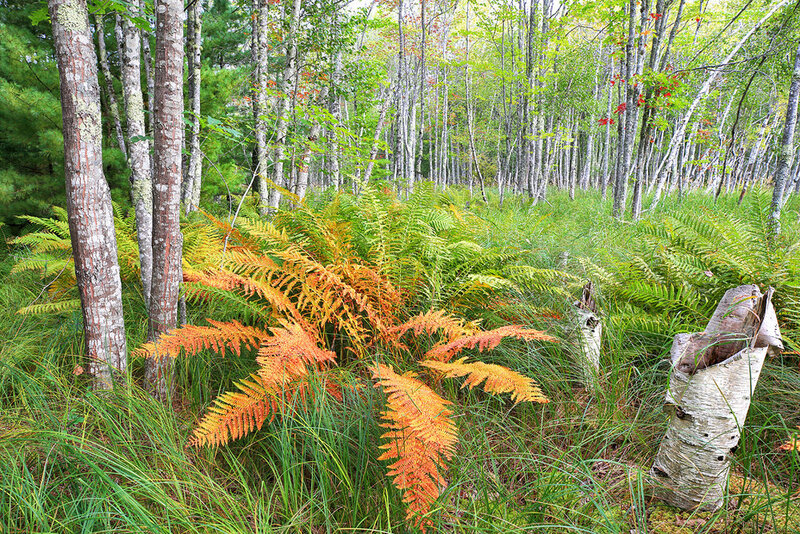 Here I was able to capture ferns changing to an incredible burnt orange color on the forest floor with bright greens all around them. 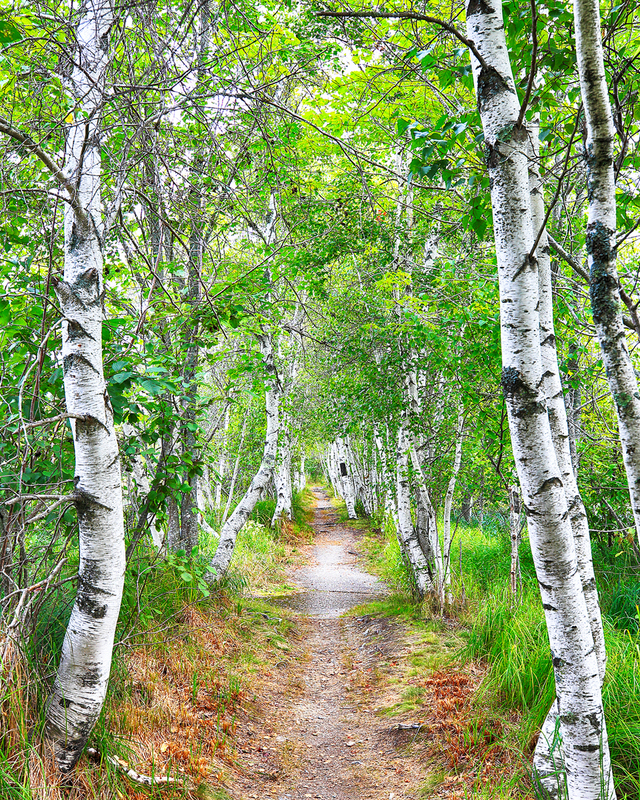 And finally after years of looking for stands of birch trees I was rewarded with them in numbers here! I spent the afternoon driving around the park and stopping at at any overlook or spot to soak in the breathtaking views of the Atlantic Ocean and powerful waves crashing against the rocky coastline. With the forecast showing clear skies for the rest of the afternoon and evening I decided to scout out the best location for some night sky shooting and ended up choosing Otter Point, where the Milky Way would be rising over the ocean perfectly from Otter Cliff. Bringing my pack chair, snacks, beverage, and of course camera gear, I setup on the cliff as the sun began to dip below the horizon and took in the serene views in front of me. As it got dark I was the only one there with the big festival event being up on Cadillac Mountain that night and it couldn’t have worked out any better. Once the sky darkened completely and my eyes began to adjust the stars and Milky Way popped out in front of me. Only having really done astrophotograhy a few times out in California this was still new to me, but I was able to capture some pretty amazing images. Hard to beat these views while the waves crash against the rocks next to me and I’m the only person in sight. The next morning I had plans of catching sunrise but my cell phone died in the tent so I awoke to brightness through my tent. Quickly hopping up to pack everything up into my car and check out of my campsite, I made my way towards the park loop for my last morning there. There was a silver lining to my morning miscue as I passed this amazing bridge in the neighboring town of Somesville that I had seen online researching but had yet to track down. The early morning light was still glowing beautifully and conditions so calm that I was able to capture a perfect reflection of the bridge. Spent a few hours in the park taking in the sights before having to began the 7.5 hour journey home. 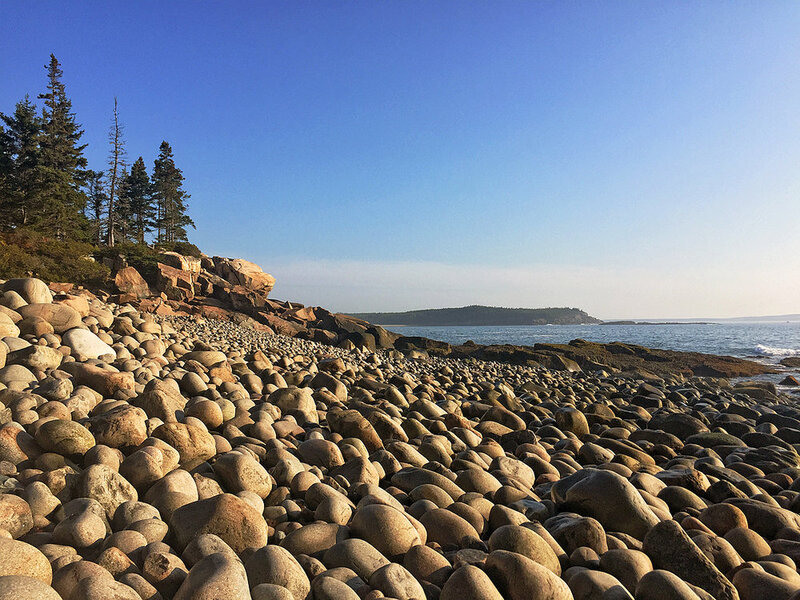 My first visit to Acadia National Park was a huge success and I’m sure it won’t be the last!